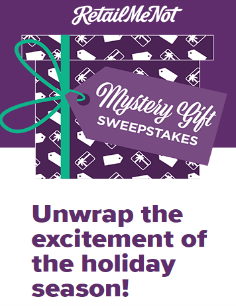 RetailMeNot Mystery Gift Sweepstakes & IWG – Win $5,000! ENTER SWEEPSTAKES HERE – Retailmenot Sweepstakes page. ELIGIBILITY – RetailMeNot Mystery Gift Sweepstakes is open only to legal residents of the fifty (50) United States (including District of Columbia) who are at least eighteen (18) years old at the time of entry. SWEEPSTAKES ENTRY PERIOD – The Promotion begins on November 2, 2016 at 12:00 a.m. Eastern Time (“ET”), ends on November 29, 2016 at 11:59 p.m. ET. PRIZES – Sweepstakes Prizes: FOUR (4) GRAND PRIZES (One (1) awarded per Entry Period): A $5,000 check. Approximate Retail Value (“ARV”): $5,000. FIFTY (50) SECOND PRIZES: A $25 retailer eGift card. Winner may select retailer from list of Sponsor provided retailers. ARV: $25.